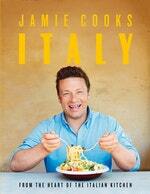 An authentic recipe for the celebrated Italian favourite from Jamie Cooks Italy. While this is one of the most famous Roman pastas, actually ham, eggs, cheese and pasta is a combination that’s been celebrated for a long time throughout all of Italy. There’s much debate about the perfect carbonara, but sourcing guanciale, going heavy on the pepper and cracking it fresh, as well as controlling the temperature of your pan, are what’s key to this fantastic, comforting pasta. I love the classic recipe I’ve given you here, but with the bolt-on of crunchy porcini breadcrumbs it just eats so well, plus it’s a nice evolution and surprise. Trim off and roughly chop the guanciale skin, then place just the skin in a blender with the porcini. Strip in the rosemary leaves, tear in the bread and blitz into rough crumbs. Toast in a large dry frying pan on a medium heat until golden, tossing regularly. Tip into a bowl for later. In the same pan, briefly toast the peppercorns, then crack and pound in a pestle and mortar until fine. Pass through a sieve, discarding anything left behind. Remove the frying pan from the heat for a few minutes to cool slightly. Cook the pasta in a pan of boiling salted water according to the packet instructions. Meanwhile, chop the guanciale into 1⁄2cm chunks, sprinkle into the frying pan with the pepper, and place on a medium-low heat until the fat has rendered out and turned golden. In a bowl, beat the eggs, then finely grate in most of the Parmesan and beat again. Using tongs, drag the pasta straight into the guanciale pan, letting some starchy cooking water go with it to break the frying. Toss with all that gorgeous flavour, then remove from the heat and – of utmost importance – wait 2 minutes for the pan to cool before adding the eggs (if it’s too hot, they’ll scramble; get it right and they’ll be smooth, silky and elegant). Moving the pasta, toss in the eggs, loosening with extra cooking water, if needed. Plate up immediately, finely grate over the remaining Parmesan and serve with the golden breadcrumbs, for sprinkling. 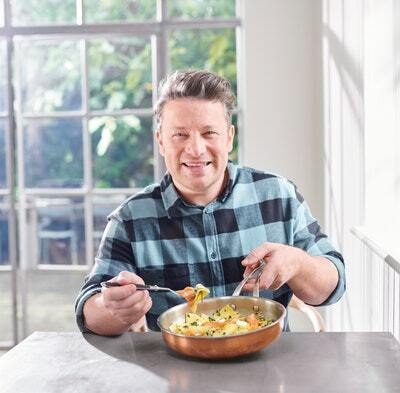 Jamie Cooks Italy by Jamie Oliver is published by Penguin Random House © Jamie Oliver Enterprises Limited (2018 Jamie Cooks Italy), photography: David Loftus.